These requirements can all be met by intramedullary osteosynthesis for suitable indications. The modern generation of nails is highly user-friendly and application of the systems is very safe. Outcome predictions favor reamed locked nailing for suitable fractures, whereby reaming should be moderate. The need to activate the dynamization option should be evaluated six to eight weeks postoperatively. "The idea of inserting a foreign body into the medullary cavity of a broken bone in order to achieve healing in proper alignment is not new. Metal wires, pins, and ivory bolts have been used for this purpose. The insertion of these foreign bodies was not possible without exposure of the fragments and the associated risk of infection. The essence of Kuntscher´s procedure is primarily the insertion of a foreign body at a site away from the fracture. It differs in this point fundamentally from preceding conventional procedures of sanguinary fracture treatment?" These are the remarks by A. W. Fischer that introduce Kuntscher's "Technique of Intramedullary Nailing" published in 1945 (10). Kuntscher developed Smith-Petersen's concept of femoral neck nailing further and extended it to include application to the long bones. Today, intramedullary osteosynthesis is definitely the most widespread management approach to diaphyseal fractures of the lower extremities. The original intramedullary nails were designed as implants with a v-shaped cross section to be inserted into the medullary cavity for the purpose of stabilizing the fracture by impinging on the walls of the canal and thus creating friction. However, traumatologists today now have a broad range of highly specialized and versatile nail designs at their disposal. Modern nail generations can be inserted, for example, in antegrade or retrograde technique in the treatment of diaphyseal fractures of the femur. Thus, it has been possible to broaden the original range of indications and greatly improve user-friendliness. Development is ongoing. The original Kuntscher or intramedullary nail was designed in the form of a slotted clamping sleeve (5). Its introduction into the reamed medullary cavity stabilized the fragments by creation of radial and longitudinal stresses. Interfragmentary compression was only possible for axial loading and was only applicable to particular types of fracture in the diaphyseal mid third. Torsional deformities were not addressed. The first important modification of the Kuntscher nail was the introduction of holes in the nail to accept locking bolts. The nail modifications by Grosse - Kempf produced a design whereby the implant is able to absorb forces of compression and torsion at the points of locking so that the bridged fracture zone is only exposed to low forces. In addition, reaming of the medullary cavity increases the interface between the bone and the implant, which consequently increases mechanical strength. A further gain in stability arises from an increase in implant diameter. These design changes have led to a substantial modification and expansion of the indication spectrum, for example, even fractures in the metaphyseal region of the femur and tibia can now be treated by intramedullary osteosynthesis. Simultaneously, the need was arising for thinner implants and there was a move away from the slotted design with greater torsional stiffness as a consequence. The loss of loading capability due to the nail's smaller diameter was compensated by the use of alternative materials (titanium alloys) and solid implants. Although these solutions did not achieve the desired mechanical benefits, they did have biological advantages because elimination of the reaming procedure and the hollow cavity within the nail reduced susceptibility to infection (12). On the other hand, lack of cannulation meant that guide wires could not be used, therefore, it was more difficult to implant the nail. It was only later that cannulated implants for insertion in unreamed technique were introduced. In recent years, nail design has been modified so that fixed-angle connections between the nails and bolts are possible. This modification and the locking option at the far distal end of the nail have led to an even greater expansion of the range of indications. Reaming the shaft sufficiently to allow insertion of the widest possible nail in an effort to increase stability, as initially recommended, has proven unnecessary. Furthermore, the incidence of side effects related to the reaming procedure is reduced in unreamed nailing technique. Modern intramedullary implants that are cannulated nails with a correspondingly small diameter can be inserted in both reamed and unreamed technique (see Fig. 1). The choice of a suitable intramedullary internal fixation procedure must take into account the individual vascular situation. Reaming the medullary cavity impairs intramedullary vascularity. Restorative activity is generated by the intact blood supply of the periosteum (5). If this has been injured or is damaged iatrogenically, serious trophic disorders may result. Consequently, an internal fixation procedure should provide maximum possible stability and cause minimal damage to the blood supply. According to AO principles, intramedullary nailing is a method of internal splinting of the diaphysis that leads to relative stability at the fracture site. The fracture heals by way of callus formation. An injured person manifests systemic reactions in addition to alterations directly affecting the fractured bone. These reactions arise due to fat intravasation from the bone marrow into the veins, which occurs mainly as a result of intramedullary pressure increase during reaming and insertion of the implant into the medullary cavity. Wenda et al. recorded pressures of 420 to 1510 mm Hg during reaming of the femur (21). Interestingly, pressure increases during actual insertion of the implant were distinctly lower (140 - 210 mm Hg). Wenda et al. also found evidence of embolic events due to bone marrow particles. Embolic events have been described by numerous surgeons (16). In their experimental investigations, Miiller et al. found that pressure changes are closely related to the properties of the flexible reaming shaft (13). The speed of reaming also plays a decisive role. The surgeon must take undesirable effects such as the development of ARDS (Adult Respiratory Distress Syndrome) into account, especially if there is acute or chronically impaired pulmonary function (polytrauma, lung contusion, etc.). The original Kuntscher nail was only suitable for the treatment of simple shaft fractures because of its biomechanical properties. Reaming the medullary cavity facilitated the insertion of larger diameter implants, thus enlarging the bone-to-implant interface and, consequently, increasing the stability of the fixation. A broader range of indications was achieved by application of locking nails. These implants made it possible to treat more complex and more proximal or more distal fractures by the method of intramedullary fixation. (see Fig. 2). Modern implants are usually designed with three locking options at both ends of the nail and fixed-angle locking options are already available. 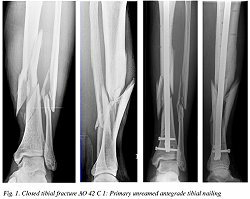 According to the recommendations of the "AO / ASIF - Long Bone Expert Group", all tibial AO 42 A - C fractures can be stabilized with intramedullary nails (9). These recommendations apply equally to both open and closed fractures, whereby the risk of infection is much higher for open fractures, therefore, the surgeon needs to give very thorough consideration to the appropriateness of the indication. On the basis of our experience, it seems that the same range of indications can be stated for the femur (AO 32 A - C), whereby the management of AO 31 A 1 - 3 fractures requires the insertion of specially designed intramedullary implants with a femoral neck component. The choice of implant and the number of locking positions is left to the discretion of each individual surgeon as is the treatment of conditions outside the indications under discussion here. The more metaphyseal the fracture site, the more complete the assembly should be, that is to say, that a maximum number of locking options should be exploited (see Fig. 3). In multiply injured patients, indications for intramedullary nailing of femoral fractures must be evaluated more strictly in terms of systemic effects due to fat emboli and their cardiopulmonary consequences for the patient. Relevant thoracic injury in a polytraumatized patient with an ISS > 24 represents a risk factor for development of ARDS with subsequent multiple organ failure (15). The development of different nail designs in recent years has meant that, as a rule, the same implant can be inserted in both reamed and unreamed technique. Modern implants are generally cannulated. Solid nails offer no mechanical advantages over cannulated designs although the risk of infection is indeed lower because there is no 'dead space' inside the nail (12). 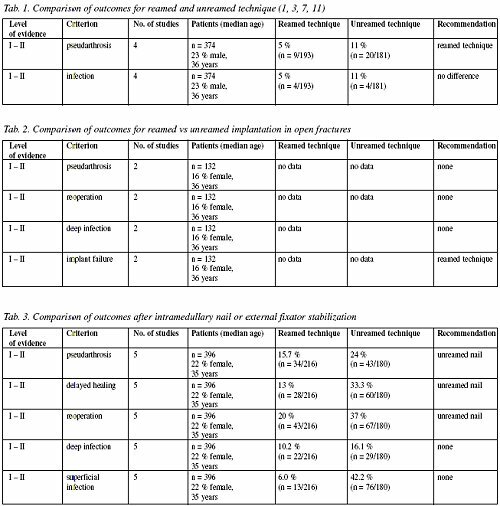 Results of comparative studies of reamed vs unreamed technique in the management of closed tibial shaft fractures have shown that a higher incidence of disordered fracture healing can be expected after unreamed implantation, see Table 1. Likewise, it has been confirmed that unreamed implantation offers no special advantages with regard to possible infection (1,3,7,11). Similar findings were obtained for the management of open fractures of the tibial diaphysis: there was no advantage of one procedure over another with regard to disordered fracture healing, revision rates, or infection, however, implant failure does occur more frequently for nails inserted in unreamed technique. It would seem that these remarks apply equally to fractures of the femoral diaphysis (see Fig. 4). In their prospective randomized study of 81 patients, Tornetta et al. experienced technical difficulties more often for osteosynthesis in unreamed technique (20). There were no differences with regard to operating time, postoperative transfusion requirements, or time to healing. Reference has already been made to systemic reactions to the reaming procedure. The incidence of embolic events is however relatively low and can be influenced by appropriate actions on the part of the surgeon. Ultimately, the method of implantation should be selected solely on the basis of fracture type and the specific needs of each individual patient. Needless to say, alternative stabilization procedures are available to deal with these situations, in particular, external fixation as a temporary or definitive solution. In contrast, reamed technique is to be preferred for simple fractures, especially those mid shaft or in situations of healing disorder (with cancellous bone grafting) since the benefits of higher primary stability can be exploited to advantage here. Open fractures require careful planning and implementation. This is particularly true for intramedullary osteosynthesis and associated soft tissue management. First and second degree open fractures according to Gustilo can be stabilized with locking nails if soft tissue coverage can be achieved around the same time. Additional risk factors should be excluded (PAD, Diabetes mellitus). Unreamed implantation should be preferred in such cases (17). A two-stage procedure can be planned for more severe open fractures, also for polytraumatized patients and, especially, in cases of imminent or manifest adult respiratory distress syndrome (ARDS) (15,16). After primary stabilization with afixator, management can be changed to intramedullary osteosynthesis, provided the local and general condition of the patient has sufficiently stabilized (4). It is recommended that antibiotics should be administered prophylactically (single shot perioperatively) during surgery to exchange implants. This revision should be carried out within 10 days at the tibia to preempt infection at the Schanz screw insertion sites. If the primary implant remains in situ for longer than 10 days, an interval with immobilization in plaster should be respected until the insertion sites have healed (6) (see Fig. 6). The choice of approach depends on the site and extent of the fracture. In any event, it should be as small as possible. The incision should lie in the extension of the medullary cavity and not be too near to the bone. In this way, blood loss and, for smaller bone apertures, the incidence of heterotopic ossifications can be kept to a minimum. Standard procedure involves a proximal approach to both the femur and the tibia. Nowadays, nails for insertion at the greater trochanter are recommended for the femur in an effort to avoid the difficult and sometimes risky approach through the piriform fossa (femoral neck fractures, disturbed perfusion of the femoral head). 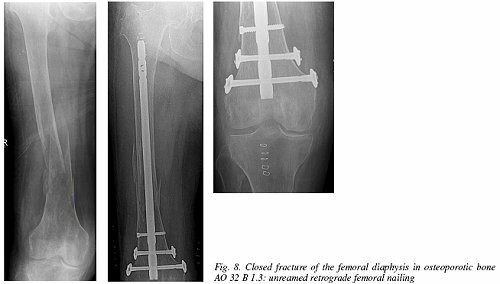 Retrograde insertion of the implant may also be a valid approach to the femur. This applies primarily to distal fractures classified as AO 33 A1 - 3, but also to any femoral shaft fracture with concomitant tibial fracture. It is advantageous in these cases to stabilize both fractures through a median, infrapatellar approach. Patient positioning is simplified in this way and making one approach rather than two optimizes operating time. The choice of approach depends on the site and extent of the fracture. In any event, it should be as small as possible. The incision should lie in the extension of the medullary cavity and not be too near to the bone. In this way, blood loss and, for smaller bone apertures, the incidence of heterotopic ossifications can be kept to a minimum. Standard procedure involves a proximal approach to both the femur and the tibia, however, retrograde insertion of the implant may also be a valid approach to the femur. This applies primarily to distal fractures classified as AO 33 A 1 - 3, but also to any femoral shaft fracture with concomitant tibial fracture (see Fig. 7). It is advantageous in these cases to stabilize both fractures through a median, infrapatellar approach. Patient positioning is simplified in this way and making one approach rather than two optimizes operating time. Other indications for which this approach is recommended are bilateral injuries, acetabular fractures, obesity, pregnancy, or multiple injuries (14, 18). Chan et al. studied 77 patients with fractures of the femoral diaphysis. They observed significantly shorter healing times after a retrograde approach to nail insertion (2). However, no differences were identified with regard to knee pain, swelling, function, or postoperative axial alignment. The authors recommend the retrograde approach (see Fig. 8). It is important to ensure that the approach at the knee is minimal. Schandelmaier et al. were able to show that the postoperative integrity of the knee depends not only on nail insertion into the bone, but also on the length of the incision (19). Having completed the transition from simple nails to locking nails, the most recent models have been designed so that dynamic fixation is still possible even with the proximal and distal locking bolts in place. This can be achieved either as part of primary nail fixation or as a secondary procedure for the purpose of dynamization, i.e. the selective extraction of some of the static bolts without interfering with the secure rotational stabilization of the fragments. It is generally recommended that two bolts be inserted in each main fragment. Whenever possible, the surgeon should endeavor to achieve dynamic locking as a primary procedure (9). Secondary dynamization is carried out after approximately six to eight weeks depending on the progress of consolidation. It is possible to introduce the locking bolts at the insertion end of the nail with the assistance of the aiming device. At the end distant to the insertion site, however, locking has to be performed in free-hand technique, usually with the aid of a radiolucent angular drive for medullary reaming - a procedure that is associated with increased exposure of the surgeon to radiation. Intramedullary osteosynthesis is a standardized procedure for the management of both open and closed fractures of the lower extremities. However, the risk of pseudarthrosis in cases of open multifragmentary fractures, especially at the tibia, is not to be forgotten. The probability of healing disorders is greater for unreamed implantation. In contrast, the risk of infection is independent of the method of nail implantation. Nevertheless, excessive reaming should be avoided. Implant failure is more likely after unreamed insertion. If the risks of external fixation alone are compared with those of unreamed locked nailing in the management of open fractures, there can be no doubt that intramedullary nailing is the more advantageous procedure (see Tables 1 - 3). Všechny tyto požadavky splňuje ve vhodných indikacích nitrodřeňová fixace. Současná generace hřebů je šetrná k pacientům a použití těchto systémů je velmi bezpečné. Výsledky hovoří u správně indikovaných zlomenin ve prospěch předvrtaných zajištěných hřebů, přičemž frézování musí být šetrné. Potřeba dynamizace by měla být posouzena šest až osm týnů po operaci. 1. BLACHUT, P. A., O'BRIEN, P. J., MEEK, R. N., BROEKHUYSE, H. M.: Interlocking intramedullary nailing with and without reaming for the treatment of closed fractures of the tibial shaft. A prospective, randomized study. J. Bone Jt Surg., 79-A: 640-646, 1997. 2. 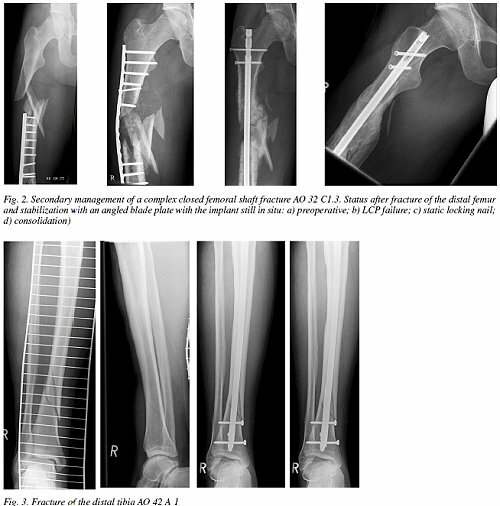 CHAN, K. Y, SINGH, V. A., MARIAPAN, S., CHONG, S. T. B.: Antegrade versus Retrograde Locked Intramedullary Nailing for Femoral Fractures: Which is Better? European Journal of Trauma and Emergency, 33: 135-140, 2007. 3. 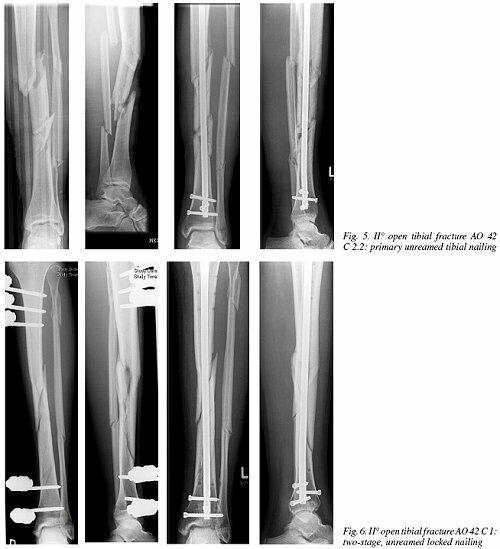 FINKEMEIER, C. G., SCHMIDT, A. H., KYLE, R. F, TEMPLEMAN, D. C, ŘEČKA, T. F: A prospective, randomized study of intramedullary nails inserted with and without reaming for the treatment of open and closed fractures of the tibial shaft. J. Orthop. Trauma, : 187-193, 2000. 4. GONSCHOREK, O., HOFMANN, G. O., BUHREN, V: Interlocking compression nailing: a report on 402 applications. Arch. Orthop. Trauma Surg., 117: 430-437, 1998. 5. HAVEMANN, D., GOTTORF, X: Kuntscher's intramedullary stabilization versus other osteosynthesis procedures. Chirurg, 61: 417-421, 1990. 6. 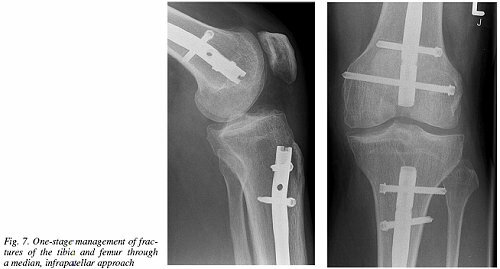 HONTZSCH, D., WELLER, S., ENGELS, C., KAISERAUER, S.: Change in the procedure from external fixator to intramedullary nailing osteosynthesis of the femur and tibia. Aktuelle Traumatol., 23, Suppl 1: 21-35, 1993. 7. KEATING, J. E, O'BRIEN, P. J., BLACHUT, P. A., MEEK, R. N., BROEKHUYSE, H. M.: Locking intramedullary nailing with and without reaming for open fractures of the tibial shaft. A prospective, randomized study. J. Bone Jt Surg., 79-A: 334-341, 1997. 8. KRETTEK, C: Principles of intramedullary fracture stabilization (1). Unfallchirurg, 104: 639-651; Quiz 652, 2001. 9. KRETTEK, C.: Principles of intramedullary fractures stabilization (2). Surgical technique. Unfallchirurg, 104: 749-769; Quiz 770-771,2001. 10. KŮNTSCHER, G., MAATZ, R.: der Marknagelung. Edited, Leipzig, Georg Thieme Verlag . 11. LARSEN, L. B., MADSEN, J. E., HOINESS, P. R., OVRE, S.: Should insertion of intramedullary nails for tibial fractures be with or without reaming? A prospective, randomized study with 3.8 years' follow-up. J. Orthop. Trauma, 18: 144-149, 2004. 12. MELCHER, G. A., CLAUDI, B., SCHLEGEL, U., PERREN, S. M., PRINTZEN, G., MUNZINGER, J.: Influence of type of medullary nail on the development of local infection. An experimental study of solid and slotted nails in rabbits. J. Bone Jt Surg., 76-B: 955-959, 1994. 13. MULLER, C, FRIGG, R., PFISTER, U.: Effect of flexible drive diameter and reamer design on the increase of pressure in the medullary cavity during reaming. Injury, 24, Suppl 3: S40-47, 1993. 14. 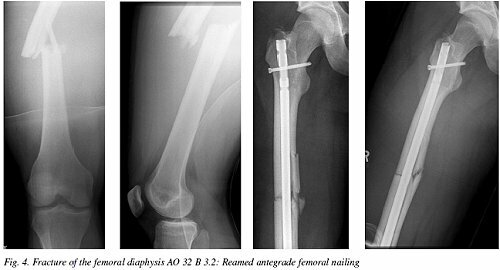 OSTRUM, R. F, DiCICCO, J., LAKATOS, R., POKA, A.: Retrograde Intramedullary Nailing of Femoral Diaphyseal Fractures. In: OTA, Edited, 1997. 15. PAPE, H. C, KRETTEK, C, MASCHEK, H., REGEL, G., TSCHERNE, H.: Fatal pulmonary embolization after reaming of the femoral medullary cavity in sclerosing osteomyelitis: a case report. J. Orthop. Trauma, 10: 429-432, 1996. 16. PAPE, H. C, REGEL, G., DWENGER, A., KRUMM, K., SCHWEITZER, G., KRETTEK, C, STURM, J. A., TSCHERNE, H.: Influences of different methods of intramedullary femoral nailing on lung function in patients with multiple trauma. J. Trauma, 35: 709-716, 1993. 17. RÜEDI, T. P., MURPHY, W. M.: AO Principles of Fracture Management. Edited, Stuttgart - New York, Thieme. 18. SANDERS, R., KOVAL, K. J., DiPASQUALE, T, HELFET, D. L., FRANKLE, M.: Retrograde reamed femoral nailing. J. Orthop. Trauma, 7: 293-302, 1993. 19. SCHANDELMAIER, P., KRETTEK, C, WOLTER, K., TSCHERNE, H.: Ability to Kneel after Tibial Nailing: The Length of Incision Matters. In: OTA. Edited, 1999. 20. TORNETTA, P. 3rd, TIBURZI, D.: The treatment of femoral shaft fractures using intramedullary interlocked nails with and without intramedullary reaming: a preliminary report. J. Orthop. Trauma, 11: 89-92, 1997. 21. WENDA, K., RITTER, G., DEGREIF, J., RUDIGIER, J.: Pathogenesis of pulmonary complications following intramedullary nailing osteosyntheses. Unfallchirurg, 91: 432-435, 1988. Práce byla přijata 10. 8. 2007.